One of the things that makes a good first impression is your home exterior. If you take care of it, you will leave a lasting impression on your guests, neighbours and passers-by. Among the things that need good maintenance is your patio. Mud, grime and algae can make your patio very unappealing. 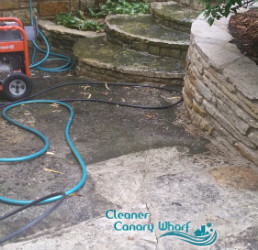 We recommend that you go for our patio cleaning service in Canary Wharf E14. We will get rid of grime, moss, mud, dirt, stains and whatever has made your outdoor area look unattractive. We work with precision and care, taking our time. Every service is carried out to a high standard. Our mission is to leave your patio dirt-free. We promise to satisfy your needs. Give it a try. With all the tools and products we have, we can ensure your patio is cleaned to a high standard. You don’t have to worry about anything. We will remove the dirt meanwhile protecting your patio from damage. You will be glad about choosing our patio cleaning service in Canary Wharf. Our methods of cleaning are splendid. 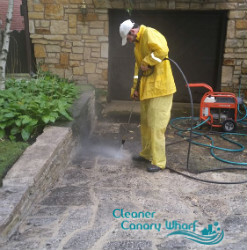 We use powerful high-quality machines that not only deal with grime and mud, but also remove algae, weeds and moss that protrude above the ground. We mostly use high pressure and hot water to loosen debris and get rid of it. Our pressure washing system enables us to remove paint, gum, mud and stubborn stains. The results are simply amazing. You are going to like them. Cleaning your patio from time to time will ensure the area stays undamaged in the years to come. We strongly recommend you use our patio cleaning service in E14 Canary Wharf to keep your outdoor area looking at its best. We think you will be happy. To book a service, get to speak with our representatives. Our phone lines are open 24 hours a day, 7 days a week. We are expecting your call.